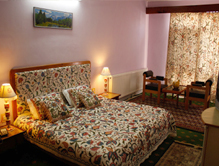 Located in the surrounding area of the famous Dal Lake of Srinagar, Hotel Pin Grove is one of the luxurious hotels of Srinagar that grab traveller’s attention and interest. 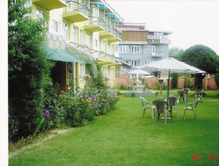 Visitors heading towards the hotel will get fascinated with the scenic appearance of the hotel because of the lush green lawn in the back and front side. With the personalized guest services and unrivalled ambiance, the guests can enjoy a relaxing and comfortable stay in the Pin Grove hotel. Guests can visit some of the major attractions of Srinagar like Mughal Gardens, Dal Lake and mountain ranges that enhance the overall beauty of the place. 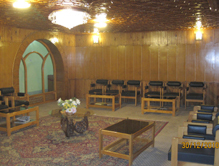 Travellers in this hotel can take pleasure of all the modern services and amenities expected during their Srinagar holiday tour. Accommodation All the 40 guest rooms and 4 beautiful suites of the hotel are individually decorated with luxurious amenities and have attached private bathrooms with daily housekeeping and toiletries. Guests can witness the stunning views of the surrounding mountains right from the balcony of their rooms. Some of the other facilities exclusive to the hotel that guests can avail in the room are cable T.V and EPABX telephone with direct STD/ISD dialling, centrally heating system, 24 hour front desk and Wi Fi internet. Dining Guests can enjoy delicious and healthy meals during their stay in the hotel. The “Taste” restaurant of the hotel offers a variety of Cuisines with exquisite atmosphere. The chefs of the hotel offer food for all tastes. Right from lip-smacking local Kashmiri food to others like Indian and Continental, the hotel serves a wide variety of food. At Tour My India, we offer the best hotel packages that can perfectly match your needs as well as the budget. Get your accommodation book in Hotel Pin Grove and enjoy a hassle free stay during your vacation.